After the Ryan Clady experiment failed last season (Clady finished with a 47.2 grade), the New York Jets signed T Kelvin Beachum and forewent drafting an offensive lineman. It appears left tackle is now Beachum’s job to lose in 2017, which could be good news for the Jets, if he regains his old form. In 2017, Kelvin Beachum will face five of PFF’s six highest graded edge rushers in Khalil Mack, Cameron Jordan, Von Miller, Joey Bosa and Melvin Ingram. 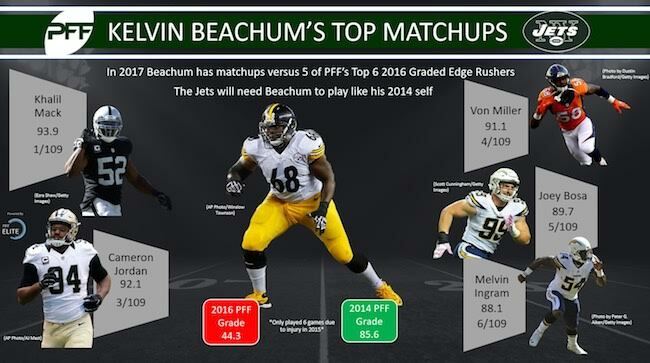 Last season, Beachum finished with a 44.3 PFF production grade, 63rd out of 78 qualifiers. Beachum allowed 47 total QB pressures in 2016, 11th most of 74 qualifying tackles. In an injury shortened 2015 season, Beachum earned a 77.7 overall grade, and posted a pass block efficiency (PBE) rating of 96.9. Beachum posted a career-best PBE of 97.5 in 2014, which was best among 78 qualifying tackles. He also finished with a 85.6 PFF production grade, fifth best among 84 tackles.